Bloody symbols in a locked room. A missing victim. Lots of clues but no explanation. There is only one person the police can turn toâ€¦once theyâ€™ve had a cup of tea. The arcane symbols daubed on his bedroom wall donâ€™t help. Neither does the fact that theyâ€™re written in his own dripping blood. Nor that the missing minister is a philandering, pompous git. He doesnâ€™t believe in the occult. Heâ€™s convinced itâ€™s just another tawdry urban crime. But Kylah suspects someoneâ€™s paying a terrible price for dipping a toe, or something even less savoury, in the murky depths of the dark arts. 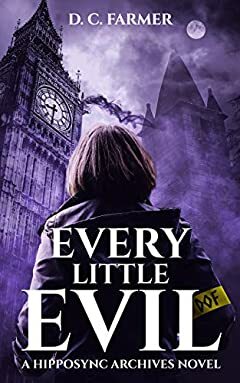 Every Little Evil is an urban fantasy crime novel full of intrigue, mystery and dry, sardonic humour. If you like Jim Butcher, Terry Pratchett, Ben Aaronovitch, Robert Crane, Shayne Silver, Patricia Briggs, Megan Scott MolinÂ or Wilkie Martin, youâ€™re sure to LOVE this, short, sharp andÂ FREEÂ first instalment in the Hipposync Archives. Now re-released with new covers. Click or tap BUY NOW to jump into a world YOU wonâ€™t want to leave TODAY. And itâ€™s totally FREE for crying out loud.